Warm up: What did all of the civilizations that we studied this year have in common? Essential Question:How did life in Europe change after the fall of Rome? Learning Target:I can explain how the people of the Middle Ages use symbols to express themselves. Medieval Families, how would you feel? ​What is/was a coat of arm? Today you will design your very own coat of arm. Explain the means of the symbols and colors that you choose. Share your coat of arms with the class. Review coat of arms activity and complete it. Today the last day of school. I am so very proud of each of you and how hard you have worked this year. I love you all and wish you all the many blessing. I hope you have a wonderful safe summer. Warm up- ​Go over handout on Alexander. This handout was given out on Friday. Learning target:I can identify ancient Greek achievements in arts, architecture and science. Study guide for the test on ancient Greece on Thursday. Learning target: I can identify ancient Greek achievements in arts, architecture and science. ​Study guide for the test on ancient Greece on Friday. Review for test and complete study guide. As you watch the Discovery Ed video complete the video follow along sheet. Warm up- Go to school net and review Ancient Greece Test. Learning target:I can identify ancient Rome achievements in arts, architecture and science. Agenda: Due to benchmarks we did not have social studies today. ​Essential question:How did Rome become the dominant power in the Mediterranean region? Learning target: I can identify the major geographical features of Rome. No School Today. I hope you all have a wonderful Easter, see you on Wednesday. Write a paragraph titled How Geography May Have Affected the Development and History of the Roman Republic. Be sure to answer the following questions in your paragraph: 1. Where is Italy located? 2. How did mountains affect life in Italy? 3. How do you think Rome's location on the Mediterranean affected its history as it began to grow into a world power? Share your paragraph is a shoulder buddy make any corrections that you need to before I collect it. Field Trip to Appalachian State University. Warm up:What brothers supposedly founded the city of Rome? Warm up: Who were Romulus and Remus? Warm up: Who were the Etrusancans? Roman government was made up of three parts that worked together to run the city. Make a chart that compares the following : Magistrates, Senate, and Assemblies and Tribunes. As you read pages 303-305 write information about each part of the Roman Republic's government. Warm up:Compare the government of Ancient Rome to our government. Warm up: What were the Twelve Tables? Learning Target: I can explain how Rome's society helped it become a major power in the ancient world. Due to the lab in science today, we only completed the warm up today in social studies. Quick Review of the Roman Government: By watching the following video it should allow you to review the information we have been learning about. Take some notes as you watch the video and use the notes you take on the "quiz". Raise your hand when you complete the quiz. Who was the paterfamilias? What role did he play in Roman society? What power was wielded by the paterfamilias? What was the relationship of the Roman family to the Roman state? List some of the characteristics of the official Roman state religion. What did the hearth symbolize for the Roman family? Who took care of the hearth? How was religion linked to the state in early Roman times? What were some of the key virtues that were taught to Roman children? We have been learning about the Ancient Roman government and how we adopted many ideals from them. Below are several questions that I would like for you to answer. Think about each question and what you know before you answer. What cycles and patterns seem to recur throughout history? How do beliefs and practices of various cultures evolve over time? Is history told by the "winners"? Is history inevitably biased? How do different cultures express their own values and traditions? How are the beliefs and practices of various cultures related to time, location, and events? How does knowledge of the past influence us and help us understand the present and the future? How do economic, historic, environmental, social, and technological forces cause change? How has the world changed in 100 years: socially, technologically, economically and politically? After reading the handout pick five of the most amazing people, places of ideas and write about how it affected Rome. Warm up: How did Rome influence our founding fathers when they were creating our country? Brian storm-make a bull's eye with Rome in the center. What do you know about Rome? Each group will have twenty minutes to gather information about the topic. Next your group will be divided into next groups. These groups will create an all about Rome and share this with the class. Warm up: Complete your group activity All About Rome. Learning Target: I can explain how Rome grew politically and economically and developed a culture that influenced later civilizations as it changed from a republic to an empire. Complete your all about Rome activity and share with the class. Create a T chart with Julius Caesar and Octavian (Augustus)-list five or more facts about each man. Add a column to the chart titled Before and After. Place information that led to the rise of the men. Write a paragraph on which man you feel had the greater influence on Rome. Warm up: What qualities should an effective leader posses? Julius Caesar a short video. Complete the T chart on Julius Caesar and Octavian, the paragraph. Warm up: Who was Augustus? Read page 329 to help you answer this question. Learning Target: I can explain how Rome's Republic ended when Augustus became the emperor. How did the Republic differ from the Emperor? What role did Julius Caesar play in end of the Republic? What happened on March 15 to Julius Caesar? How did this effect Rome? How did Augustus govern differently than Caesar? ​Ticket out: Explain how Augustus influenced Rome. Learning Target: I can explain how Rome's inventions helped it become a major power in the ancient world. Today we will learn about inventions that the Romans created and how these inventions help to Rome to achieve greatness. First let read read pages 326-328. 1.What are some important innovations and inventions from ancient Rome? 2. Why was the Pantheon built? Why was it designed with a rotunda? 3.How were Roman bathhouses heated? 4.Why were aqueducts an important innovation? What was their purpose? ​5.How were Roman roads built? ​Ticket out: Pick one of the inventions that we have discussed, which one do you feel had the greatest impact on Rome and why? Warm up: List inventions from Rome. Learning Target: I can describe ways Rome has influenced our modern world. 2. Who were the patricians in Roman society? 3. Who were the plebeians? 4. Why did the ancient Romans decide to govern themselves? 5. What did slaves do in Rome? 6.What were the Twelve Tables of Law? 7. How did the Twelve Tables change Roman law? 8. How did the other people influence Roman society? 9. Why did the plebeian love Julius Caesar? 10. Why did the senators fear Julius Caesar? Ticket out: You are to create a 3, 2, 1 using the information from today. Warm up: Create your our bull's eye about Rome. Learning Target:I can explain how the Romans influence our world. Task 1: The Roman Gladiators- The ancient Romans are often seen as bringing civilization to the western world, but they regarded the slaying of gladiators as a normal form of entertainment. 1. List four reasons why you wouldn't want to be a Roman prisoner. What would be your fate? 2. Describe how you were bought and sold. Include information on the sick. 3. List three things that happen if a slave's owner sends him to a ludus gladitorius. 4. Name five types of gladiators and what were there functions. 5. What other types of entertainment for the crowd took place before the actual fight took place? 6. What could a Gladiator do to prevent his death? 7. Explain the following: a. finished off, b. dragged away, c. cleaners, d. Describe the Coliseum of Rome. Include when and why it was built, and what it was used for other than gladiatorial combat. e. How were people seated in the coliseum? f. How did spectators sometimes become part of the show? List three facts about the following fashions: men, women and children. Describe the Bulla and its purpose. Learning Target: I can explain how the Romans influence our world. 1. Who were three "imported" gods to Rome? 2. Which emperor converted the Roman Empire to Christianity? When did this happen? Task 4: Famous Roman Emperors: Complete the handout to discuss the positive and or negative impact on the Roman Empire. 1. 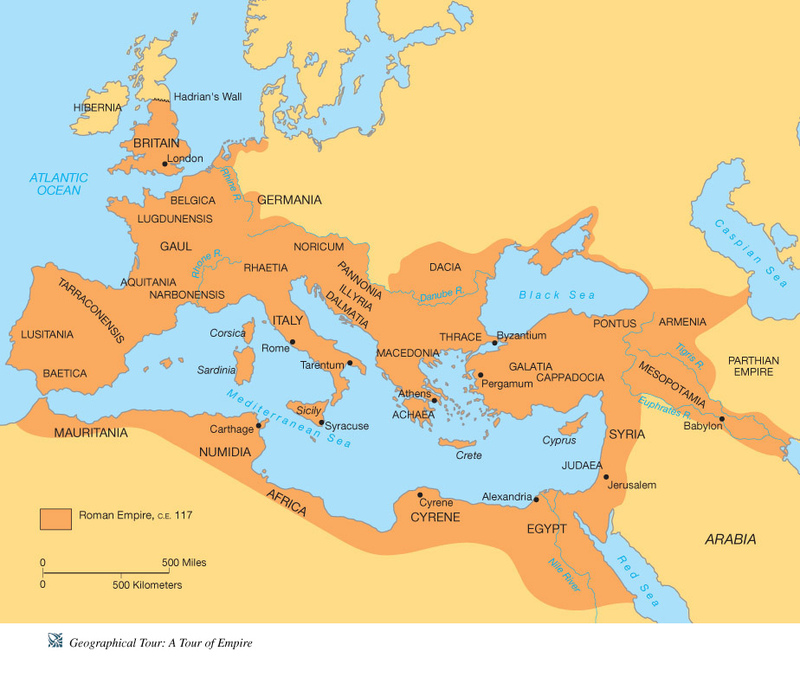 Name several lands that were part of the Roman Empire in 12 C.E. 2. What additional lands did the Romans gain control of by 150 C.E.? 3. How did the size of the Roman Empire change between 150 C.E. and 500 C. E.? 4. What do you think caused the size of the Roman Empire to change? 5. Which modern day countries did the Roman Empire comprise of? Provide five examples. 6. Why did the Roman army need a more advanced Road system? Warm up: Explain how the Roman roads were build? Essential question:How did Rome become the dominant power in the Mediterranean region? Answer the following question on the Twelve Tables by clicking on the blue terms. 1. By about the 6th century BC, what were the two basic social classes in the Roman Republic? 2. Which social class had the power to make the laws? Which laws 3 laws are still applicable for today's society? Explain why. ​The web-quest is due today, so make sure that all of your task are complete (you have answered all questions) and staple in order. One more question- is your name of your paper? Warm up:Read the handout "Reasons for the Fall of Rome" and complete the questions. Learning Target:I can explain how the many land forms and climates affected the ways of life that developed during the middle ages. ​Draw a table with three columns and three rows. Label the columns: Southern Europe, Northern Europe, and Far Northern Europe. Label the rows: Topography, Climate and Ways of Life. Use the information on pages 496-499. 1. What countries are located on the peninsulas of Europe? 2. What countries are islands in Europe? 3. What country is farthest north? 4. What sea forms the southern border of Europe? Ticket out: How might the region's climate affect how people live in each region? Warm up:How did the geography of Europe affect the people of the middle ages? Read the following to help with your answer. Learning Target:I can explain the events that brought unity to Europe and which brought division or disruption to Europe after the fall of Rome. Warm up: Read the biography of Charlemagne on page 505 and answer the following questions: 1. When did he live and where did he live? ​2. What did he do? 3. Why is he important? Learning Target:I can explain the duties and obligations governing the relationships between people in the Middle Ages. Create a mini poster that shows and explains the feudal society of the Middle Ages. Ticket out: Explain the duties of each: Kings and Queens, Nobles/lords, Knights, and Peasants. Learning Target:I can explain how the daily life during the Middle Ages. Pyramid directions: Show the relationship between Kings, Lords, Knights, and Serfs. Develop own to represent the role of each, be creative in your symbols. Answer the following: 1. What was life like at each level? 2. What obligation did each level have? 3. What was the King required to do for his Lords? 4. What did the Serfs have to provide? Use the resources below to help you with today task. Lets visit Mr. Donns to learn about daily life in the Middle Ages. Discovery Ed Living in Midevil Europe- as you watch this complete the worksheet that I have given you. Learning Target:I can explain how diseases like the black death affected the people in Middle Ages. Complete a five W chart on the plague. List some of the effects of the Black Death in Europe? Ticket out: How did life change due to the Black Death? Warm up: Quiz on the Black Death Read the following information and take the quiz. Learning Target: I can explain the effects leaders had on the people of the Middle Ages? Who was King John?How did he effect the people of the Middle Ages? What is the Magna Carta? How did it effect the people of the Middle Ages?